I was on Pinterest a few days ago when I came across something I hadn't seen before. Now, given how many hours a week I devote to my addiction, this was significant. Not much gets past these eyeballs. 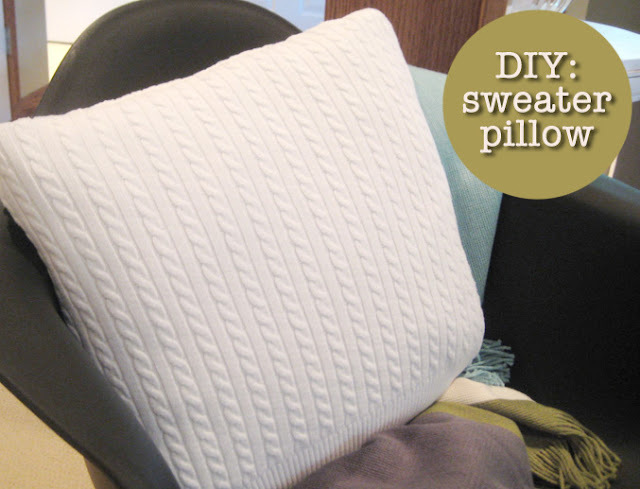 Upcycled sweater pillows! Brilliant! I pranced on over to the thrift store to get a cheap, neutral sweater I could use as my guinea pig. As usual, this project was extremely easy. 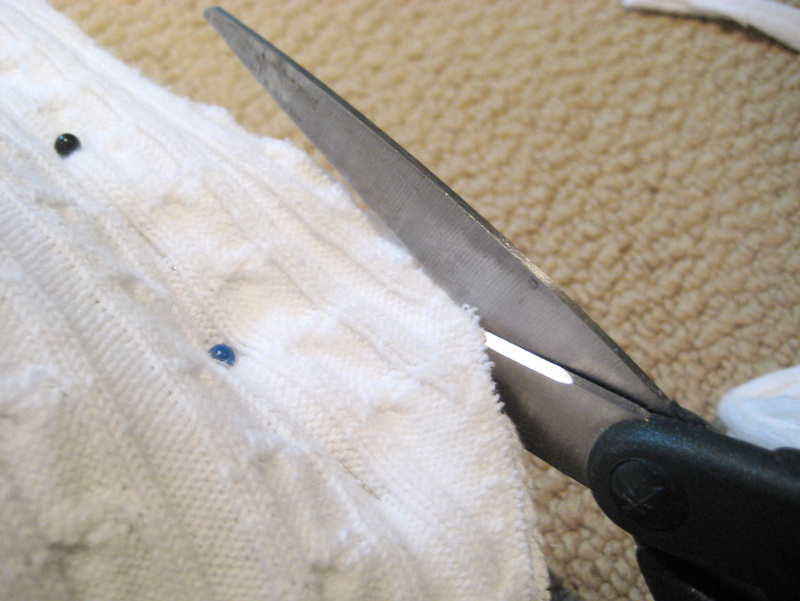 Once the pins are in place, cut off the excess fabric. I left about an inch to make sewing easier, but I went back after that was done and trimmed even more. 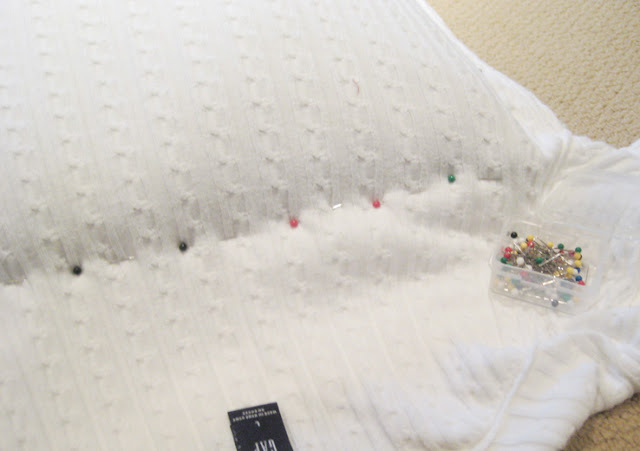 Sew around three sides of your pillow case, leaving one open for re-inserting the pillow. Turn the cover right side out and place the pillow inside. For sewing the final side shut by hand, I recommend the slip stitch so there's a seamless look all the way around. This tutorial explains it with excellent pictures. Once you've closed that last seam, step back and admire your work. You're done! This is so soft and cozy I think I'll make a few more for fall and winter. Have you ever made anything out of an old sweater? 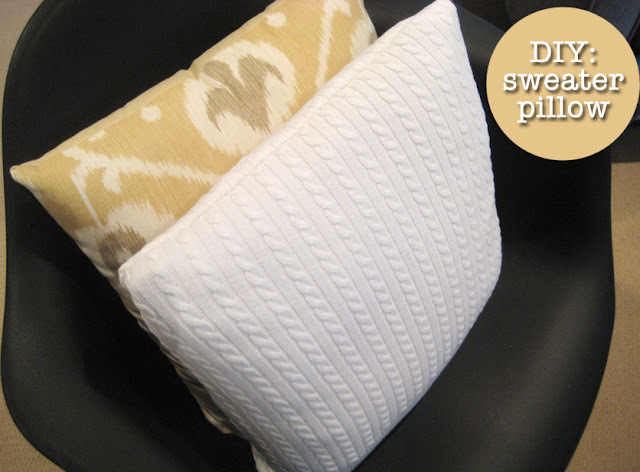 Or used some other non-traditional material to make a pillowcase? I like felting wool sweaters for sewing projects. Me too! I remember once I tried to felt an acrylic sweater thinking it was woolen. Ah, the fun of getting to know fiber! What a great idea! I upcycle wool sweaters into diaper covers, wool backed nursing pads and just started using my small scraps for the center of felted wool dryer balls. I will have to try this one, so fun! Annie, you seem to have found all ways possible to upcycle a sweater! Maybe you would be willing to share some tips with us in a future post? Fun! Looks cozy. I've made pillowcase out of old grain feed sacks - they always have neat "label" looking designs on them. Yes, the look so cool when transformed into pillow-cases! Haha, you sweater-killer! I am sure that you deeply regret this outburst of creativity! So you plan on killing again?! I can hear sobs already! This is such a great idea. Thanks for sharing. I love the simple and cozy projects that you show. It gives me inspiration that I too can create simple treasures for my home. Blessings to you. Thanks for sharing this project. I'm going to give it a try for holiday decor. Fun project! I love the look of a cozy sweater as a pillow. There are so many creative ideas on Pinterst.